Customizable accessories to turn a basic structure into the exact application you need for your project. 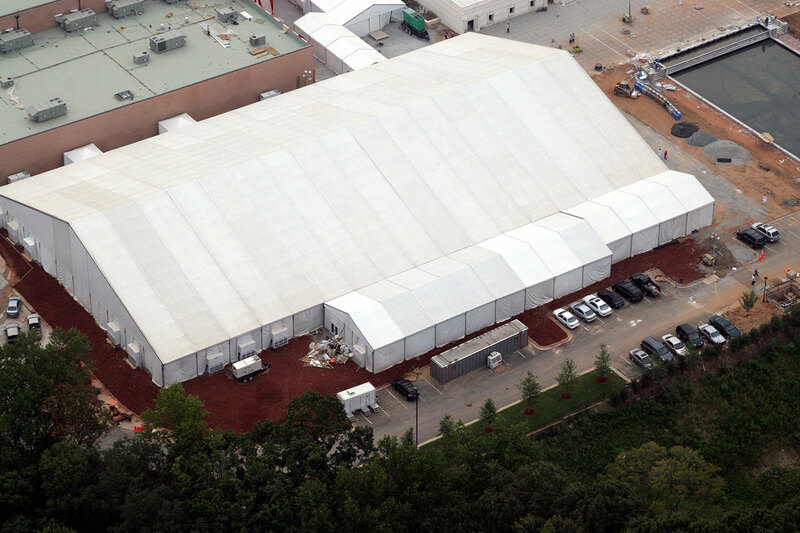 With over one million square feet of tents and frames, along with our extensive inventory of flooring, lighting, stages and other accessories, Mahaffey's fabric structures and event accessories can be fitted with virtually any accessory found in new construction, from flooring to lighting and everything in between. The aluminum box beam framework of a Mahaffey structure allows for easy installation of accessory items. In most instances, fittings can be attached to the structural frame, or Mahaffey can provide welded attachment clips to avoid the use of expensive secondary framing. This results in substantial cost savings when installing accessories. We offer various anchoring systems to accommodate unpredictable surfaces. 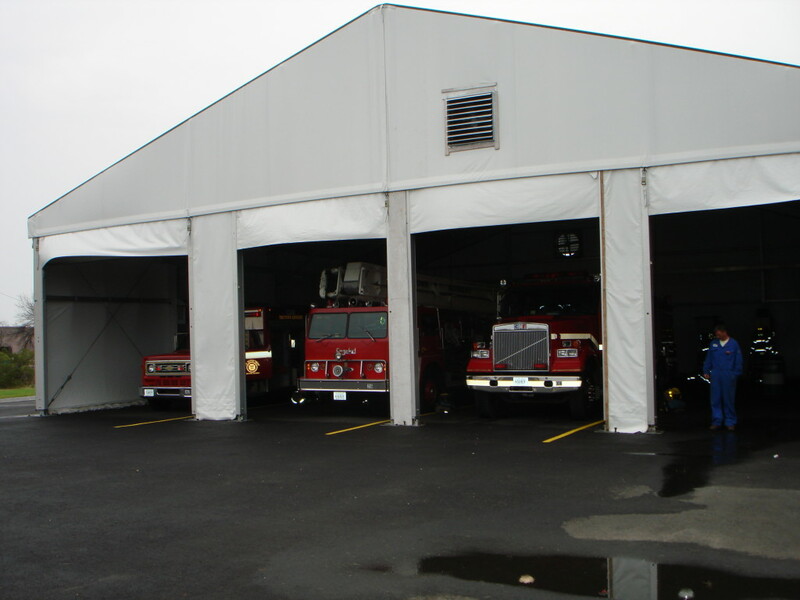 Our structures can be installed on pavement, concrete, gravel or any other ground surface. For concrete and pavement, we have a mounting foot that can be securely tied to the surface using the appropriate fasteners. If the building is to be mounted on gravel, grass or dirt, our auger-style anchors or our ground anchor kits are used. For the most secure, high wind locations, Mahaffey has proven solutions that our project team can discuss with you in more detail. Mahaffey typically uses Ferrari Precontraint Fabric, which provides exceptional dimensional stability to keep your roof flat. The composite membranes benefit from a thicker coating at the top of the threads and maintain an outstanding level of mechanical resistance over time. In the event of an accidental tear or perforation during assembly or as a result of vandalism, the high-tenacity structure of the textile prevents it from spreading. The Precontraint composite textiles comply with international fire standards enforced for buildings open to the general public. They do not drip and are self-extinguishing (automatic smoke clearance and flames are unable to spread). Translucent: The translucent tops allow natural interior lighting, which provides a bright interior at all hours of the day. This is an ideal choice for temporary warehouse structures, construction covers, or environmental enclosures. Blackout (opaque): The blackout tops eliminate any light and keep the interior of the shelter cooler. These are typically used in our Super Series™ design and are popular for shorter-term applications such as concert pavilions and corporate meetings with audiovisual programs. 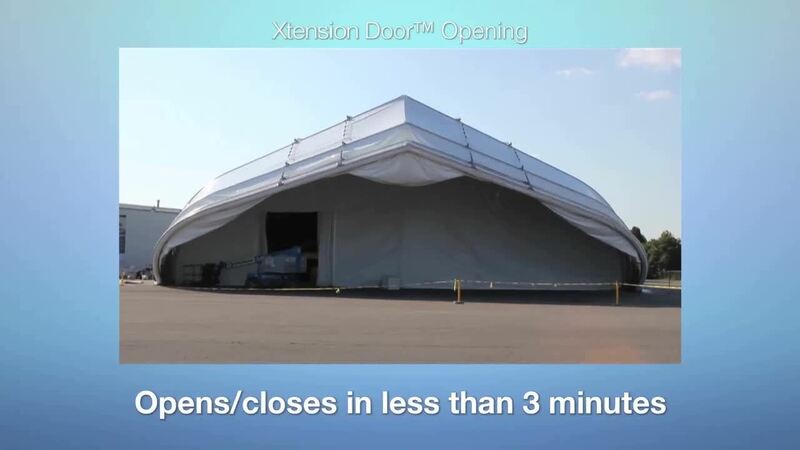 Developed by Mahaffey Fabric Structures, Mahaffey Xtension™ Door, a fully retractable fabric door, is best suited for aircraft and heavy equipment, and can be opened or closed in just THREE minutes. Check out this custom “Xtension” of the Mahaffey Tension Series (MTS™) structure in action. We typically suggest ExpoDeck, as it can bear the weight of forklifts and other heavy equipment, won’t dig in like plastic flooring and is suitable on all surfaces. Modular Wood: 4″ x 4″ wood timbers support the 3/4″ wood deck of this custom-fabricated floor. Unless it is supported by a steel scaffolding frame, this floor is installed on the ground and shows any dips or rises in the terrain. It is used by the military as-is or painted and can be carpeted for upscale applications. Thermo-plastic Flexi: These economical floors are used on asphalt or concrete sites to provide a more finished interior appearance either with or without a carpet overlay. The 3/4″ height is designed to drain rainwater beneath it, especially important for industrial structures. Bravo-Zulu: These industrial floors are designed to support light vehicular and pedestrian traffic. Light vehicles include cars, pickup trucks, small man-lifts, and smaller forklifts with pneumatic all-terrain tires. Bravo-Zulu floors have been used inside military vehicle maintenance structures and beneath helicopter landing zones. Aside from our vast selection of industrial flooring systems, we rent a wide variety of tent and event accessories to make your event and entertainment space a success. Wood Polished Flooring: Add that extra touch of prestige to your wedding or corporate event with a beautifully-polished wood floor. Bil-jax Staging: Our Bil-jax product is the top-of-the-line flooring solution that will provide a laser-level foundation for your event. It is a steel and wood floor that can be installed on multiple leg heights to level an area. This flooring is appropriate for any area (flat or hilly). The flooring can be used to level out very un-level areas, or to create multiple levels within an area. The flooring can be installed on all surfaces (grass, asphalt, concrete, etc.). The flooring has a maximum load of 150 lbs per square foot. Carpeting: Carpeting can provide a finished look to any of the flooring options listed above. Whether you are looking for standard gray or black or a custom color to match the event's decor, Mahaffey can provide and install any carpet color or style you are looking for. Clear Pool Covers: Create a unique "ultra lounge" effect, complete with under-floor lighting with a clear floor, fully engineered and installed over your pool. Semi-permanent applications usually justify more permanent flooring solutions including asphalt or concrete. The use of asphalt surprises some people, but it is 100% recyclable and can be removed post-project to leave no trace on site. 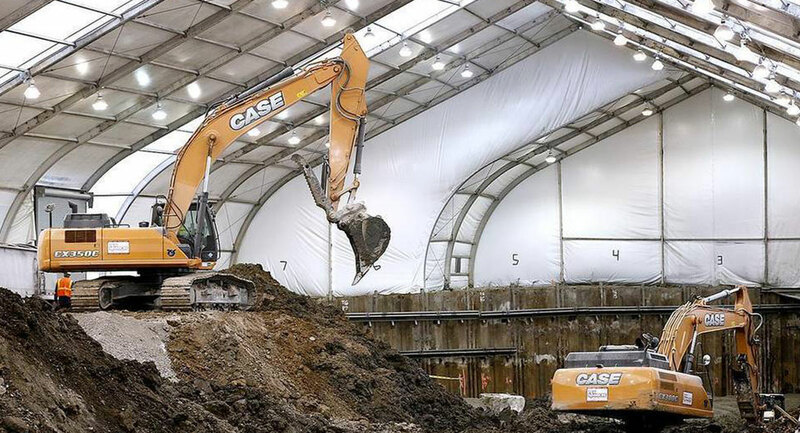 Industrial sites often have limestone or concrete pads already in place prior to installing their temporary structure, though no foundation is needed. Or sometimes they just need a construction site enclosure, which doesn’t warrant a floor. For those projects where flooring is needed, Mahaffey offers a variety of portable flooring products for virtually every application. Choosing a specific floor material depends upon the existing terrain and the weight carrying capacity desired. 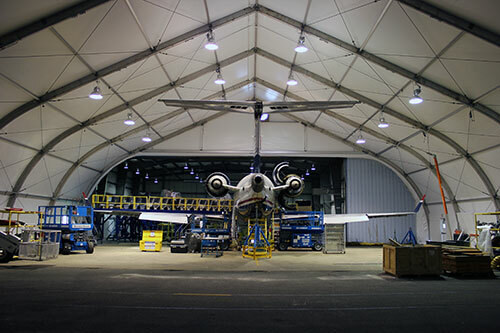 Mahaffey also offers special lighting system options that appeal to various industrial applications, as all of our fabric structures can be illuminated with any lighting system used in a brick and mortar building. 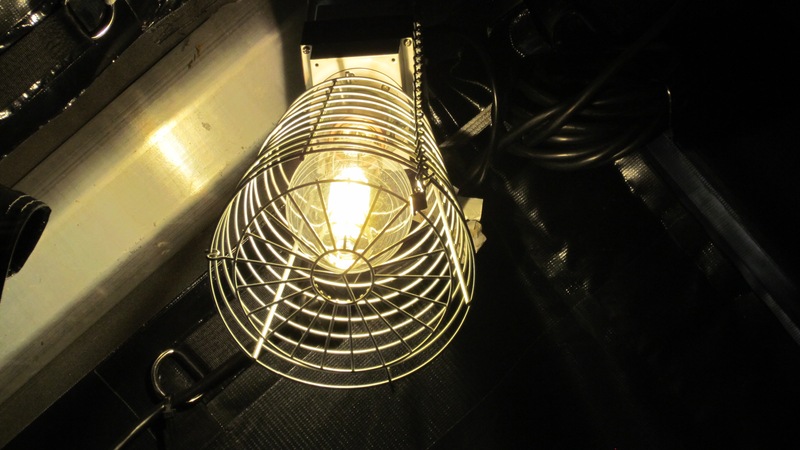 The standard lighting fixture used is our Exhibit Light, a 400-watt metal halide high bay fixture. These lights eliminate any shadows in a structure with a crisp bright white light. The comfort of your construction crews and event guests is an integral part of running a smooth construction site and successful event. 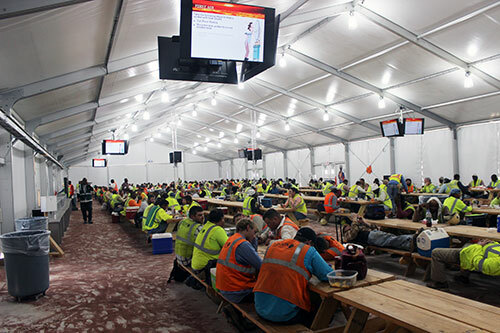 Mahaffey offers climate-controlled environments with on-site power distribution, air conditioning, heating and ventilation for all tents and clearspan structures. We can provide vented and ducted forced-air heating, approved for public gatherings, or soft-duct air conditioning systems complete with super-quiet, silenced mobile power-pack units. We also offer a full line of ceiling and upright fans, specifically designed for any industrial tent or special event. 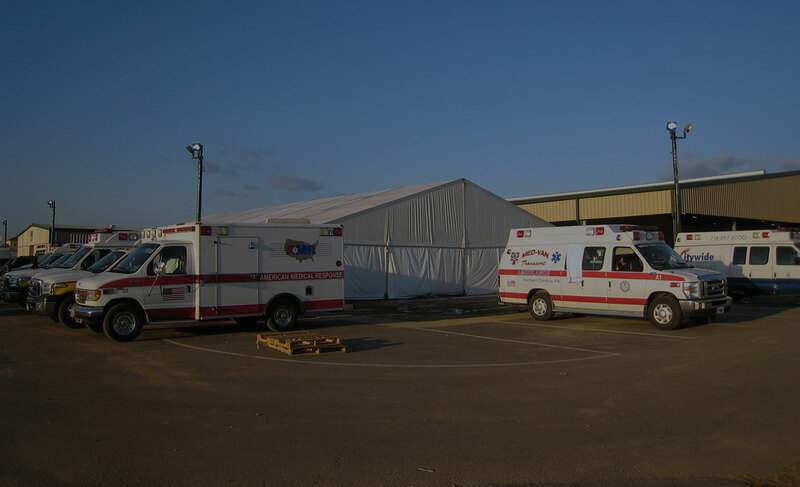 All of our portable shelter structures can be fitted with a full range of heating, air conditioning, and ventilation products (HVAC). In many cases, no HVAC is required because of the structure’s function or the temperate geographic location. In other cases, temperature control is critical for these same reasons. Within a structure, Mahaffey has had very good results with our giant ceiling fans. These fans are 20′ in diameter and cool the interior 6-8 degrees. In other cases, simple ventilation is required, especially where humidity can condense on the interior fabric. In these cases, Mahaffey uses gable end fans to evacuate the air. The most cost effective temperature control option is simple movement of air. 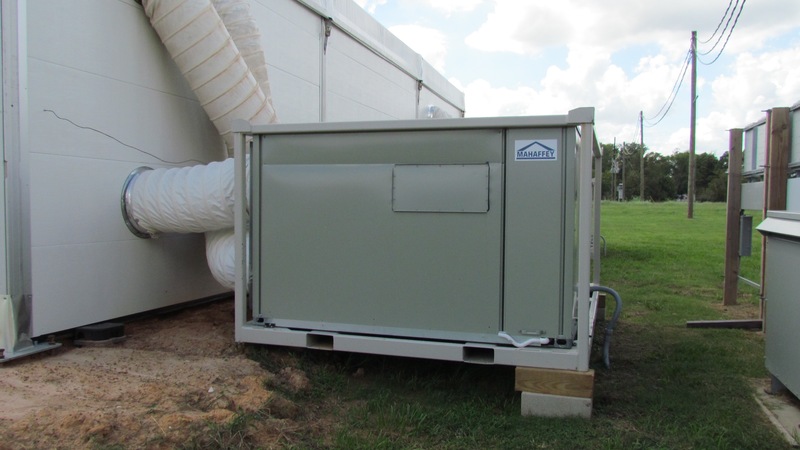 Mahaffey's full line of structure amenities can help keep your temporary warehouse cool and keep crews comfortable with proper circulation. We provide a full line of fans and AC options including ceiling and upright fans, specifically designed for any event, circulation and exhaust fans, as well as polar coolers to help you beat the brutal summer heat. 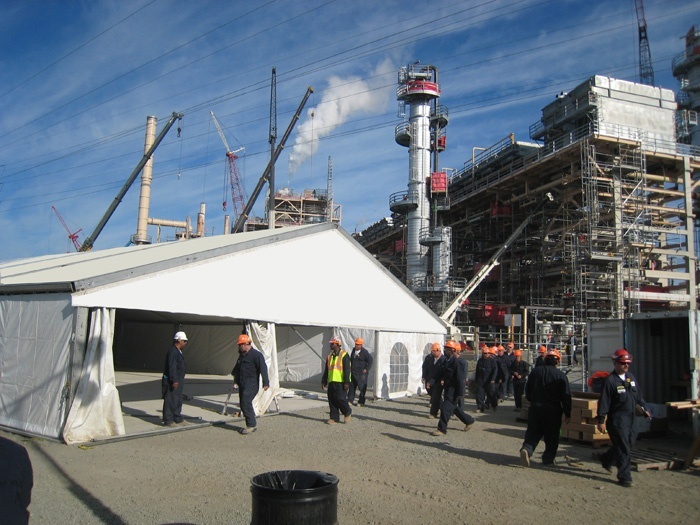 Need to heat your warehouse, lunch tent, safety or maintenance facility? Mahaffey’s industrial tent accessories include various heaters readily available, with both natural gas and propane sources of heat production. We also offer portable heaters, which are ideal for use in your temporary office, greenhouse, garage or anywhere else that heat is needed on a short-term basis. There are a variety of methods used to insulate a Mahaffey structure. For most applications, including temporary warehouses and environmental enclosures, Guardian Steel Walls™ are the optimal solution. This proprietary system has 1-3/8” insulation to keep structures warm in the winter and cool in the summer. With an R-value of 13.45, these walls give outstanding energy performance. Interior and exterior surfaces are painted steel that enclose CFC-free (environmentally friendly) polystyrene insulation. An additional benefit is that the solid barrier of steel provides security 24/7. Semi-permanent installations in extreme environments benefit from Mahaffey’s AIR™ (Air-Insulated Roof) System option. The AIR™ System is composed of two fabric layers that are sealed and filled with low pressure air. The trapped air provides a layer of insulation from temperature fluctuations. The AIR™ System also prevents condensation from forming, as it does in some environments. 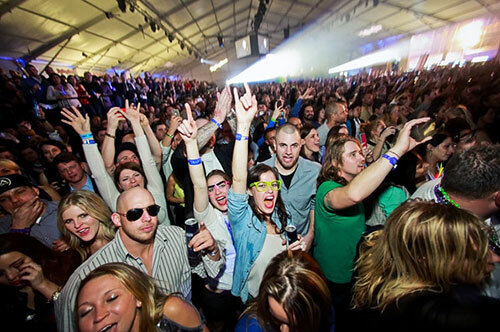 Vinyl Walls: All of our tents come complete with white vinyl walls. You have the option of clear walls, cathedral window walls and custom color walls. Glass Walls: As an alternative to our standard fabric walls, glass provides a professional and permanent-looking finish to any structure. Our 13' high glass walls provide a premium, transparent floor-to-ceiling finish that brings light and a crystal clear view to your event. 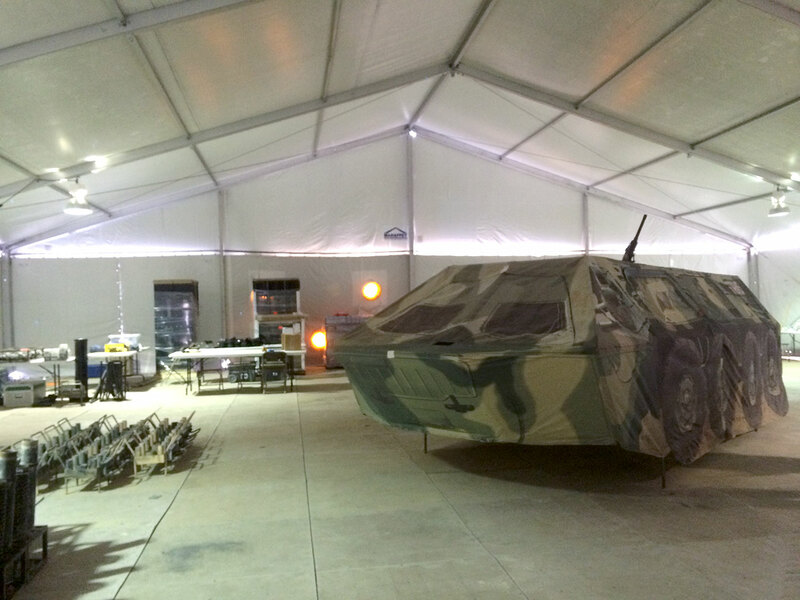 Insulated Hard Walls: We have many choices available to us to transform the look of a tent. One of the newest options is our Insulated Hard Walls - not only do they cocoon your guests from the exterior elements and provide enhanced acoustics and light control, but they also give the tent the look of a permanent structure. In-stock inventory of over 1,100,000 sq. ft.
Mahaffey offers special lighting options that appeal to various industrial applications. Mahaffey offers climate-controlled environments with on-site power distribution for all structures. 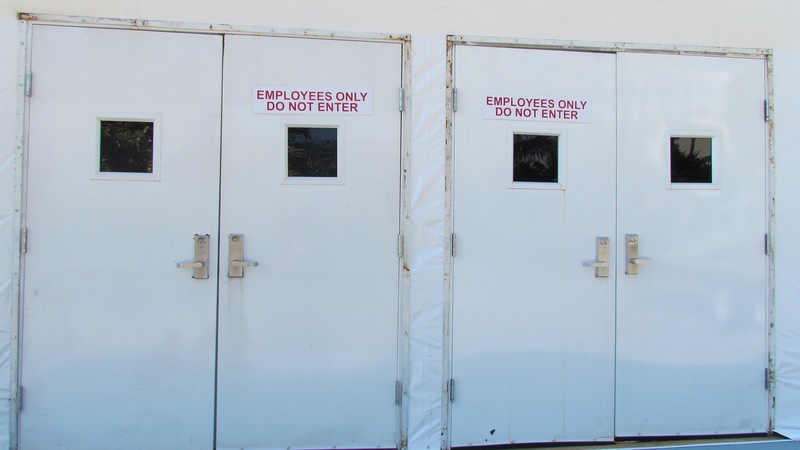 Mahaffey's portable structures can be equipped with many different industrial door options.